With only 3 weeks to go until we begin the Infusion Sew-Along, I wanted to cover a few things for those who would like to start getting prepared. Sometime ago I wrote a book called Raspberry Parlour. It was based around one of my fabric collections with the same name. Raspberry Parlour was a collection of reds, pinks and creams. I have been known to love a good red and white quilt. There is just something about them don’t you think? I still love the feature quilt, called Raspberry Tea, as much today as I did when I made it. It was such a fun quilt to make because of all of the different little blocks. Because I am known for my scrappy quilt designs I thought it would be fun to remake the quilt with a bright scrappy look and also just change up the sashing a little. Right there the Infusion quilt version was born. Join us here and follow along each month with the Infusion Sew-Along starting February 28th. 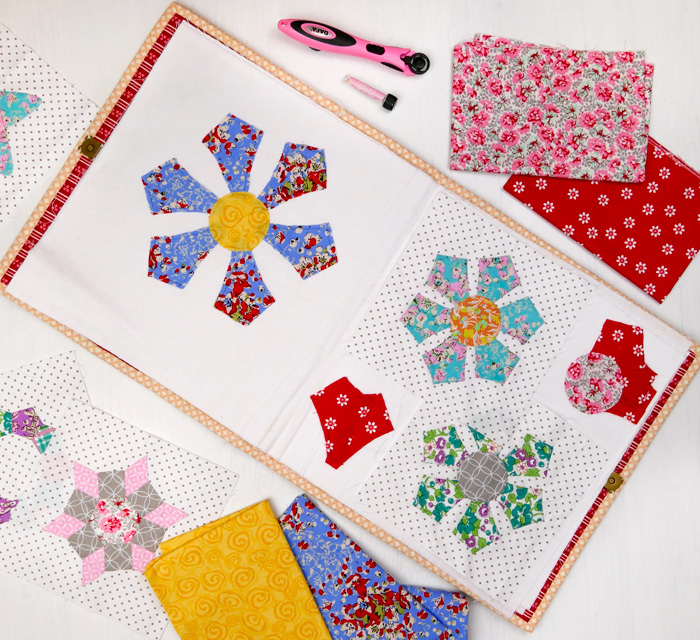 You will need the Raspberry Parlour book and the paper & template pack to create the quilt. 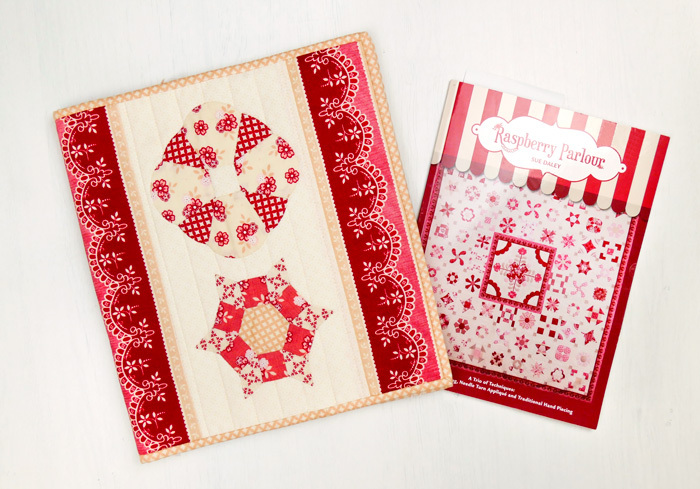 This quilt is a fabulous stash buster, simply grab yourself a Infusion Paper & Template pack and receive a FREE Raspberry Parlour Book. 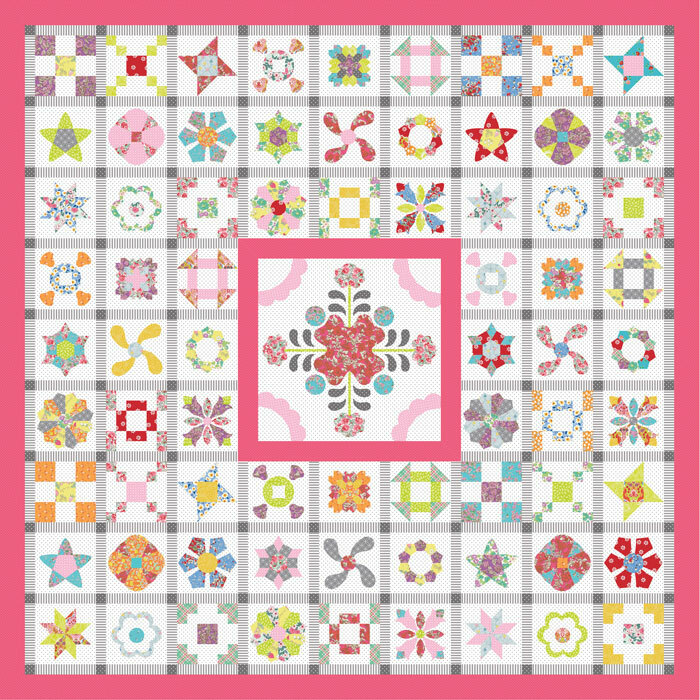 If you like my version sign up to our Block of the Month online by clicking here. Please note that the Raspberry Tea requirements list in the book varies slightly to the Infusion requirements list we are using in this sew along. I have included the new requirement list here. As we sew along together I will refer to the book and the new requirements list. The sew along will run for 11 months with some supporting technique videos to help you with tips and tricks along the way. You can find the pattern for the Infusion quilt (Raspberry Tea) along with many other patterns in my Raspberry Parlour Book. The accompanying Paper and Template Pack is sold separately and can purchased from Patchwork with Busyfingers or through your local quilt shop and remember we have a promotion running for the Sew-Along when you purchase the accompanying paper & template pack you will receive a FREE copy of the Raspberry Parlour book. Before you get started you may want to make the Raspberry Parlour Block Book to keep your blocks safe as we enjoy this journey together. So start getting organised with everything you need and I will see you in my next post to get this party started.